The New Justice Team was a short-lived team of crime-fighting super-heros. The source of the human members super-powers was Dr. FlimFlam's Miracle Cream. They worked the New New York area, and were on call for Mayor Poopenmeyer when the city was in need. The team had three members, Clobberella, Captain Yesterday, and Superking. The group thwarted many crimes, and even found a nemesis in the Zookeeper. Their careers ended after the Zookeeper kidnapped Clobberella's parents and forced the team to steal the Quantum Gemerald in exchange for their release. The fact that they ran out of cream was probably a factor as well. 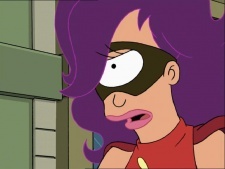 See Leela for details on this character. Description: Quick-tempered and with a very head-first approach to crime-fighting, Clobberella defeats many foes with a roundhouse kick to the head. Name Reference: The name is a spoof of the 1960s science fiction heroine Barbarella, played by Jane Fonda. Costume: A red jumpsuit with an image of a hand holding a rolling pin. Also includes a black mask, orange boots and gloves and a hairdo like the one in "A Bicyclops Built for Two". See Fry for details on this character. Description: More calm and cool than Clobberella, Captain Yesterday relies heavily on his super-speed to make up for his slow mind. Name Reference: His name refers to nobody, except possibly Captain America. He is a parody of Tony Manero (John Travolta). Costume: A white and blue jump suit with bell-bottom pants, a 1970s style haircut, a golden cape, a necklace with "C.Y." similar to a 45 record adaptor and a black mask. 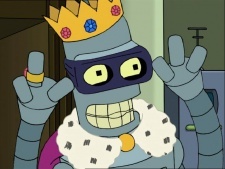 See Bender for details on this character. 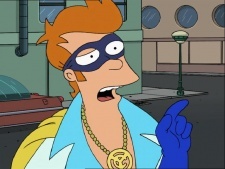 Description: Superking is a bit of a rogue (or an anti-hero), and while he fights crime with the team, he has been known to abuse his powers for his own gain. 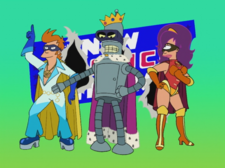 Name Reference: Most likely Superman or Burger King, but it could also be a simple figment of Bender's egocentricity, since mid-way through the team's existance, he wants to change his name to "El Zilcho". Costume: A purple fringed cape, a purple mask and a jewel-encrusted crown. Who's the newest Justice Team?